So when's the naucean anniversary hydro? Has it been one year already? I guess so. The Nauceans have come a long way from just a random sketch to being a recognized by Will Wright himself. Many fan arts and even fan music! They have evolved from a humble beginning to ascended timelords. I thank all who have read my stuff and enjoyed my pictures. If it was not for your guys comments i do not think i would have kept it going for so long. I miss those fun days also. So with a new year i plan on taking it in a new direction. Along with the Naucean history and culture i have always done i plan on making a fan fiction story. 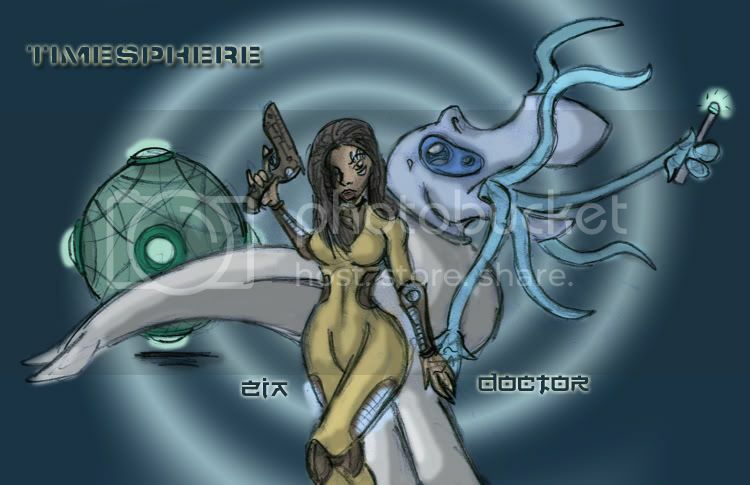 This story will be called "Timesphere" it takes place after Ascension with the last Naucean left in the universe. You may know him from before but everyone he meets knows him as "The Doctor" (yes a Dr. Who rip but i don't care its more of a homage to it). Along with him in his Timesphere, is the exotic human named Zia. She was taken from ice age Earth and has traveled with him ever since (more on that story later). What kinds of adventures will these 2 encounter in the vast fan fic universe of Spore? Stay tuned and see for yourself! WOOHOO ANNIVERSARY!!! Well 1 year...I have no clue how long It's been since I though of the Zyyo although I'm gonna say recently cos It started out differently with a different name and then I made It the way I like It now...you have some memory remembering dates like that hydro...well let's break out the pot...I mean...ummm...the glowing tentacles ...how does an Ice age woman communicate with an alien species? Does she wear some kind of translator? Man it was a pleasure to see the evolution of the Naucean history and I have enjoyed your pictures a lot. I remember those days when there were so few races out there and can't forget the first time I saw your race in the planet spore forums. Very nice job Hydro, looking forward for anything new . Have some cake! Wow, one year. What can I say? If it wasn't for you, Hydro, I never would have started drawing here myself. You've been great inspiration to us all. I also want to thank you for all the help with the creature editor, which wouldn't have been possible without you. Good luck with the new stuff! Hurray... Happy hatching/start-up/birth-day to the Nauceans. Well done Hydro. You are the greatest of us all and so are your Nauceans! The Wexxians eternal love to all Nauceans and you hydro! It looks like an evil sombreron or something. You have no idea who the Sombrerons are do you?